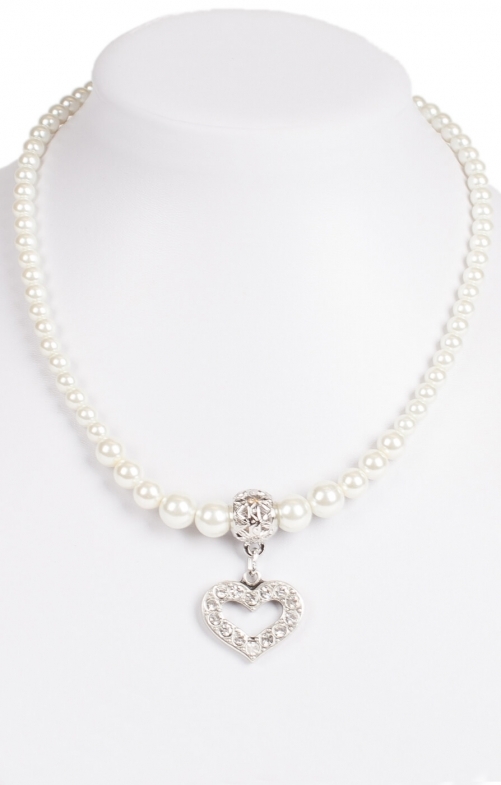 Romantic white pearl necklace with heart pendant. This sumptuous pearl necklace will gracefully adorn your neckline and draw attention to your Dirndl blouse. Beautifully accented with a single textured silver bead, this beaded necklace features a heart-shaped pendant with crystals set in nickel-free silver metal. Along with a pair of pearl earrings, it makes the perfect timeless accessory for nostalgic Trachten fans. Tolle Kette, die gut verarbeitet ist und edel aussieht. Super Bestellabwicklung und sehr schnelle Lieferung.